Marcus Osmond Smart popularly known as Marcus Smart, is a professional Basketball player who plays for Boston Celtics in NBA championship. He was born on March 6, 1994, in Flower Mound, Texas. With an excellent combination of strength, intensity, size, instinct and competitiveness, Smart was drafted in NBA in 2014. He was also the sixth overall pick. During early years, Marcus Smart used to play football and tennis. It was during his freshman year at Oklahoma State when he rose to fame. During that period Smart averaged 15.4 points a game with 5.8 rebounds and 4.2 assists to lead the Cowboys to a 24-8 record and led them to Big 12 in steals. This earned them a trip to the NCAA bracket wherein Smart and the Cowboys clinched #5 seed in Midwest region. Marcus Smart's age was only 18 years when ESPN.com considered him a five-star recruitment. He was considered as one of the top shooting guard in 2012. One particular stand out performance by Marcus smart was witnessed on November 19, 2013. He leads the way against #11 Memphis and equaled an OSU single-game scoring with record 39 points. 2013-14 season Smart brought more to his game as he was named as one of the 30 finalists for Naismith College player of the year. The best performance by him in the tournament was witnessed when Cowboys faced Gonzaga. He led the charge with 23 points, 7 assists and 6 steals thereby becoming first ever player to record 20 points, 10 assists 5 steals and 5 rebounds in tournament history. 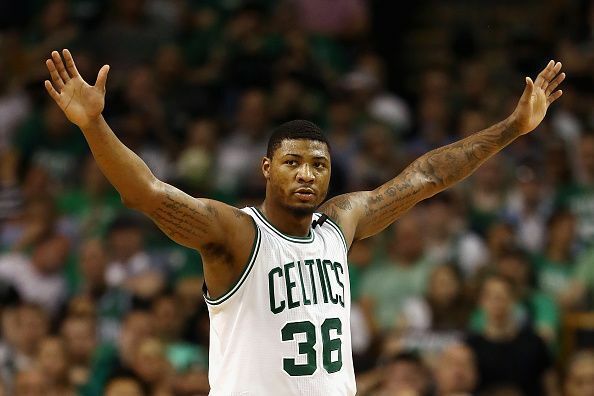 Marcus Smart college years spanned two years where he played 64 games, with 314 FG, 16.6 PPG (points per game), with 5.9 rebounds and 4.5 assists per game. In April 2014, Marcus Smart was announced for the NBA draft. Boston Celtics picked him in the sixth draft. He signed with Boston Celtics in a $ 15 million contract for four years. Smart did not start the season well and was injured in his fifth game against Indiana Pacers. Smart made back to the team against Detroit Pistons. During the course, Marcus Smart missed 10 games. His best performance in Celtics’ shirt came against Oklahoma City Thunder where he scored 25 points. That season he earned his place into NBA’s All-Rookie Second Team. He went to score his career high 26 points against Oklahoma City Thunders in that season. Smart registered his first ever career triple-double points with 10 points, 11 assists and 11 rebounds in January 2016. In 2016-17 season, Marcus Smart became a regular member in the team, with some notable performances against Washington Wizards, New York Knicks and New Orleans Pelicans. His best performance of the season was against Cleveland Cavaliers scoring his career-best 27 points to help Celtics win. Smart has 237 professional career games with 9.2 PPG, 3.9 assists and 3.8 rebounds per game.